As October winds to a close, the consumer electronics industry is making its final preparations for the holiday shopping season. Among events this week will be the Windows 8 launch – which itself includes a bevy of new computers and tablets – an Apple product refresh, and some other things that should surprise us all. The video card industry is no different, and with AMD and NVIDIA having wrapped up their product launches earlier this month, the focus shifts to competitive positioning of existing products through the rest of the year. AMD’s holiday plans will be taking a two-pronged approach. The first prong (and likely to be the greater interest to most of our readers) will be the release of a new performance-optimized driver branch for AMD Graphics Core Next hardware. The second prong will be what can only be described as an incredibly aggressive series of game bundles, with AMD capitalizing on their much improved developer relations offering vouchers for multiple different games. By improving their performance relative to NVIDIA, maintaining existing aggressive pricing, and by further tilting the value proposition their way through better bundle, AMD is going all out for the holidays in a way we haven’t seen in years. We’ll kick off this quick look at AMD’s holiday plans with a look at AMD’s new driver. AMD’s official designation for this driver will be Catalyst 12.11 (9.10.8), which is based off of a newer code branch than AMD’s previously released Catalyst 12.9 driver (9.1.0.0). AMD has sampled an early beta to the press ahead of today’s announcement, and they will be posting a slightly newer build of this driver publically at around 3pm today, with a final WHQL release slated to appear next month. So what does Catalyst 12.11 bring to the table? In short this is the 3rd major performance driver for the GCN architecture, building upon the gains AMD already picked up from Catalyst 12.2 and Catalyst 12.7. Like those previous drivers, AMD has been working on a mix of game specific optimizations and across-the-board optimizations to better utilize the GCN architecture. While there’s no such thing as a “regular” release schedule for these kinds of major performance drivers, it’s rare to see 3 major drivers in a single calendar year, so this ended up being a pleasant surprise. To get an idea of the performance of AMD’s new drivers and how it compares to earlier drivers, we’ve charted the performance of the Radeon HD 7970 (Tahiti), Radeon HD 7870 (Pitcairn), and Radeon HD 7770 (Cape Verde) against the 12.11 drivers, the 12.7 drivers, and their respective launch drivers. For the 7970 this means going back to the very start of GCN (Dec 2011), while the 7870 and 7770 launched with drivers based off of Catalyst 12.2. At 1920x1200 we’re seeing a roughly 5% across the board performance improvement for both the 7970 and the 7950. 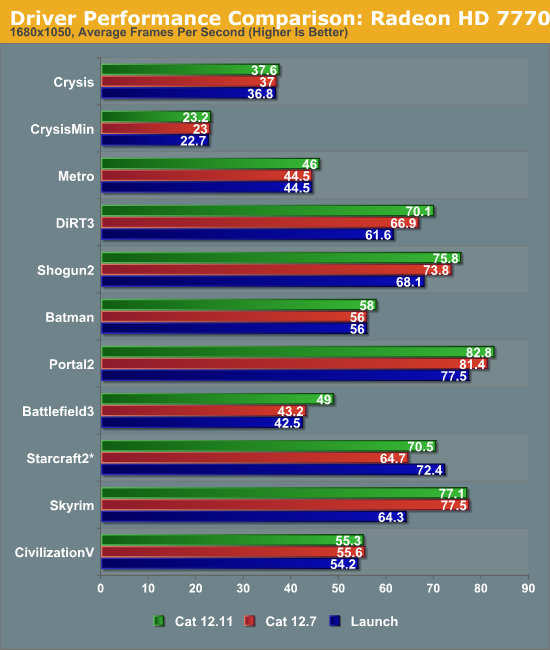 Everything except Starcraft II sees at least a marginal improvement here, with Starcraft II being the lone exception due to the previous issues we’ve run into with the 1.5 patch. The 7770 also sees some gains here but they aren’t quite as great as with AMD’s other cards; the average gain is just 4% at 1680x1050, with gains in individual games being shallower on the 7770 than they are on other cards. Interestingly even on the 7970 the largest gains are at 1920x1200 and not 2560x1600. The latter is the more GPU-limited resolution and that’s where we’d typically expect to see the largest gains, but that’s not what’s happening here. Most likely AMD’s performance improvements are targeting shading/texturing performance rather than ROP/memory performance, in which case the highest resolutions where we’re already more likely to be ROP/memory bound would be the resolutions least likely to benefit. This isn’t necessarily the best outcome since it’s at the highest resolutions that we need the greatest performance, but since most gamers are still on 1920x1080 (even with cards like the 7970) this is admittedly a more useful outcome. 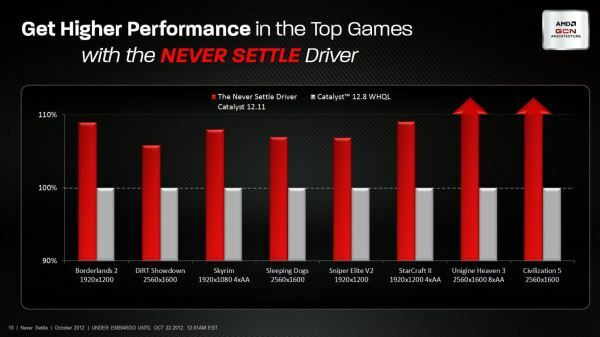 Meanwhile like most major performance drivers, even when performance is up across the board the biggest gains are seen in a handful of games, and Catalyst 12.11 is no exception. 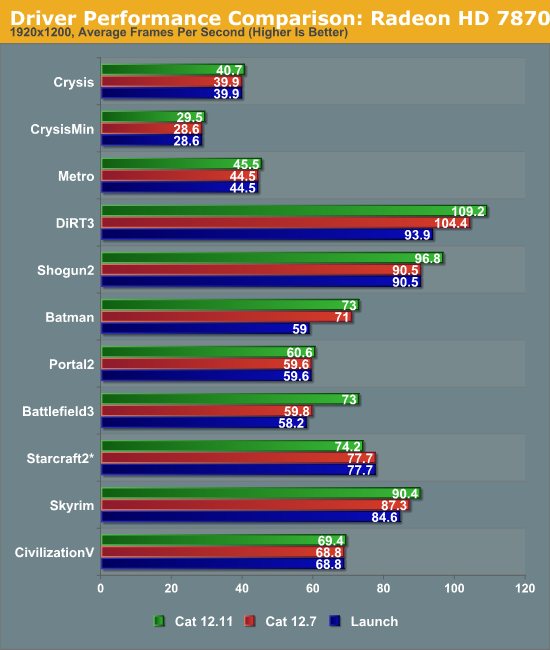 Among the games in our test suite, DiRT 3, Shogun 2, and Battlefield 3 see the greatest improvements, with the former two picking up 6-7% each. 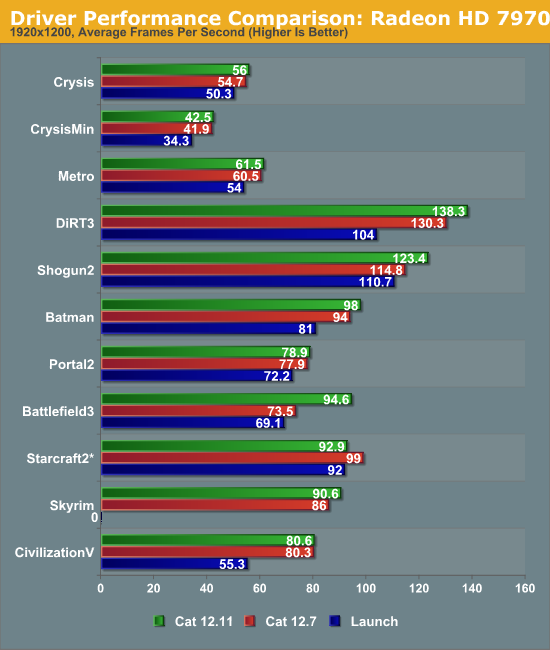 But it’s Battlefield 3 that really takes the cake: the performance improvement from Catalyst 12.11 ranges from 13% for the 7770 at 1680 to a whopping 29% for the 7970 at 1920. This makes Catalyst 12.11 a very special driver for AMD – not only are performance improvements over 20% particularly rare, but Battlefield 3 has long been a thorn in AMD’s side. NVIDIA’s hardware has until now always outperformed AMD’s equivalent hardware here, and as BF3 has remained an extremely popular MP game it’s been one of the most important games for high-end video card buyers. In other words it has always been the game AMD could least afford to lose at. 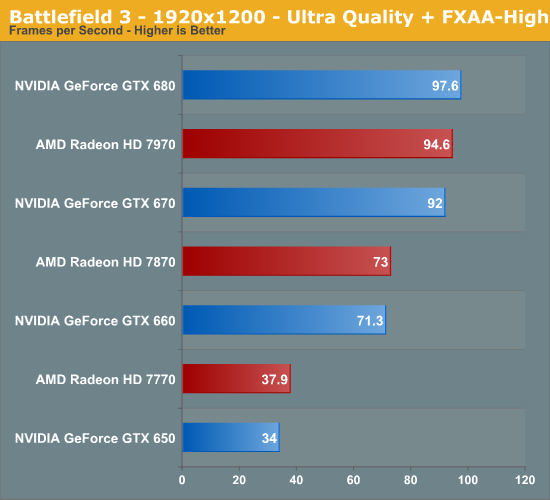 With the 12.11 drivers AMD has completely eradicated their performance defecit in BF3, with the 7970, 7870, and 7770 being made performance competitive with (if not a hair faster than) their respective NVIDIA GTX 600 counterparts in our BF3 benchmark. AMD has told us that the specific performance benefits are map-dependent with our results appearing at the high-end of their guidance, so while not every map will see the same 20%+ performance gains, some of them will while others will be in the 10% range. Much like our overall performance averages, the largest gains are at 1920 with FXAA, while 2560 with FXAA and 1920 with MSAA will see smaller gains, once again hinting that AMD’s optimizations are on the shader/texture side rather than ROP/memory. For our part we have long theorized that the Frostbite 2 engine’s heavy use of deferred rendering techniques – particularly its massive G-buffer – was the factor that AMD was struggling with. While these results don’t really further validate or invalidate that theory, what is clear is that AMD has fixed their Frostbite 2 performance problem. Given the fact that Frostbite 2 will be used in at least a couple more games, including the AMD Gaming Evolved title Medal of Honor Warfighter, this was an important engine for AMD to finally conquer. For their part, AMD hasn’t told us much about what it is they’ve done to optimize their drivers. What we do know is that it’s not driver command lists (an optional DX11 feature that NV has supported for some time), so it has to be something else. AMD has briefly mentioned surface mapping and memory mapping optimizations, but it’s not clear what exactly they’ve done there and if those are the only optimizations. 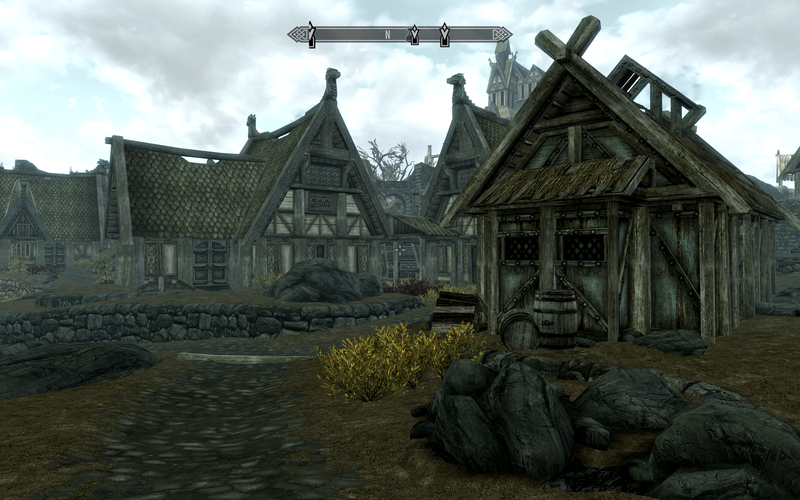 Finally, these seem to be clean optimizations, as image quality has been held constant in most of our games (e.g. : Battlefield 3). The sole exception is Skyrim, and this is something we’re certain is an unrelated bug. On our 7970 we appear to be missing a lighting pass, but only on our 7970. On our 7870 with the same exact settings everything is being rendered correctly. AMD has told us that they haven’t seen this issue in-house (it would admittedly be hard to miss) so this may be some esoteric issue; due to the short preview window and our own testing time constraints AMD hasn’t had time to look into it further. As we mentioned before, the second prong of AMD’s holiday strategy will be a rather significant holiday game bundle. Both AMD and NVIDIA have been making a greater focus on game bundles this year, and for the forthcoming holiday AMD will be going all out. Typically we see AMD bundle a single AAA game, or in the case of the Three For Free promotion earlier this year one AAA game along with a couple of cheaper games; for the Never Settle Game Bundle promotion however AMD will be bundling upwards of three AAA games with their most expensive cards. The terms of the Never Settle Game Bundle can be a bit confusing, so let’s start with a chart. 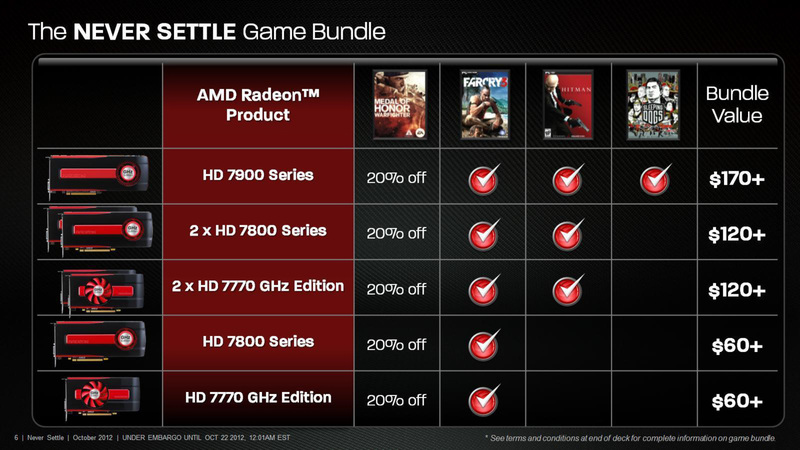 AMD will be offering games as part of the Never Settle Game Bundle with the 7770, the 7800 series, and the 7900 series. Depending on the card, AMD will be offering Far Cry 3, Hitman: Absolution, and Sleeping Dogs as free games through retailer vouchers. Furthermore they will also be offering a 20% off (~$10) voucher for Medal of Honor Warfighter. Ultimately every card that is part of this bundle comes with the MoH voucher and Far Cry 3, purchasing a pair of cards for Crossfire will add in Hitman, and purchasing any 7900 series card will add in both Hitman and Sleeping Dogs. AMD is hitting the bundles hard this year not only to steal some business from NVIDIA but as with past bundles to offer more value without actually having to cut video card prices. AMD of course pays a fraction of the retail price for these games, so offering three games for a “value” of $170 of course costs them far less than the sticker price. Still, for the 7900 series in particular this is a larger, more valuable bundle than anything else we’ve seen from AMD in recent years. Combined with their prices and improved performance, it will put NVIDIA on the defensive since NVIDIA does not have an active bundle on anything other than the GTX 650 Ti at the moment. Like always however, the value of the bundle will be in the eye of the buyer. A bundle is not the same a price cut, so these bundles will have the greatest value for buyers who are already interested in the games. To AMD’s credit they’re focusing on games that have yet to be released, minimizing the number of buyers who might already have the game with the tradeoff being that the last game in the bundle won’t be out until the end of November. Finally, like AMD’s previous bundles this is a retailer/e-tailer driven offer, buyers need to be sure to check whether their store of choice is offering the bundle. AMD hasn’t set a hard date on when the bundle will go live, and since their marketing department is typically ahead of their promotions department by a week or two we’d expect to see these bundles finally become active in November. As we mentioned before, AMD will not be making any further price adjustments for the holidays, with the game bundles intended to offset any need for price adjustments. As a result AMD’s pricing is roughly the same as it was earlier this month with the launch of the GeForce GTX 650 Ti. The 7970GE is priced against the GTX 680, the 7970 against the GTX 670, the 7950 against the GTX 660 Ti, the 7870 against the GTX 660, the 7850 ahead of the GTX 650 Ti, and the 7770 slightly ahead of the GTX 650. Given the combination of prices and game bundles, AMD is clearly intending to squeeze NVIDIA this year. BF3 was very playable even before on the 7000s on high detail, but this really is a good psychological victory for eradicating the deficit as far as the average buyer is concerned. It's behind in the chart they show, it only works well on certain maps, and is otherwise "not there" then. So, behind in the test they show, only 10% on some or less and map specific, thus even further behind, but according to the article "it has eradicated it's performance deficit or even went ahead". Further, only a fool would believe no eye candy drop, as Ryan for well over a year claimed there was none with the infamous perfect circle no visible game advantage driver he fell in love with... until he finally had to admit it - so he cannot see any eye candy problems with amd until after they release their next card series, then suddenly he will finally tell you about all the amd faults he had been hiding for the past year. That's how fan boys work, unconsciously. So what we have here is what AMD is over 1 FULL YEAR late on. That's what we have, release drivers finally here after being 1 full year late. That's why I find it so strange the wording surrounding the amd failure, as if it won. So I guess we have to go to gigahertz edition, which was already proven slower anyway. About 1200 core is where the 7970 ties the 680, but then again OC the 680. So I just find it a bit hard to take, that's all. It didn't do it. It only did great on some maps... it's shader hacks, but "no detectable" difference.. LOL heard that for a year before the added 10% IQ cheat by amd, and the wish here "that nVidia doesn't do the same thing" - which they never did. nVidia have used driver cheats in the past, stating otherwise is plain false. It was big in the days of the Geforce FX as nVidia had woeful shader model 2.0 performance on those cards.